This post could be subtitled “Words of Wisdom from Bruce Coville (with embellishments by Beth).” I first encountered Bruce Coville, author of middle grade fantasy novels and other such wondrous things, at the Summer 2011 conference of the Society of Children’s Book Writers and Illustrators in Los Angeles, SCBWI LA ’11. Not only did he give a wonderful keynote address to begin the conference, but I also took a three-hour intensive course on writing fantasy novels from him, and it was definitely one of the high notes of the conference for me. One thing I particularly remember from that intensive was the way he shared the first two chapters of his fantasy novel Into the Land of the Unicorns. He didn’t merely stand in front of us and read to us from the book. He performed the two chapters as a dramatic monologue. The action came alive. We felt, heard, almost saw what was happening, through Bruce’s animated recitation. About a week ago, I read a post on the blog “Stories are Good Medicine” about a recent speech Bruce gave at a writer’s conference. In the speech, Bruce suggested 13 top things a writer should do. I heard him give a similar listing in his keynote address at SCBWI LA ’11. Two of the items on his list might surprise many people. #2: Take Acting or Storytelling Lessons and #3: Take Singing or Voice Lessons. Those are the two items that stood out for me in his speech in August 2011, and they resonated with me again when I read that blog post. I want to be clear that I’m not suggesting (and I’m quite sure Bruce isn’t suggesting) that everyone needs to try to become a great singer, the toast of Broadway or the Opera; nor do you need to aspire to award-winning acting. 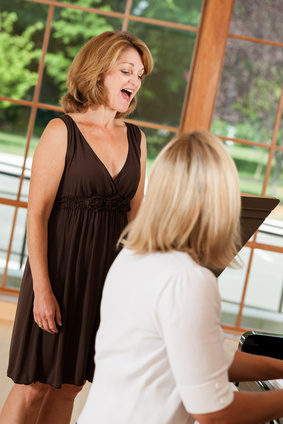 Singing/voice lessons, and acting lessons, help a person learn how to use their voice without straining it, to project the voice so it is more easily heard, to work with breath control and voice production to make one’s voice pleasant to the ear. One also learns relaxation techniques that will help with pre-speech nervousness, ways to engage one’s listeners with what one is saying, ways to connect with the audience, to get out of the printed page of notes and make eye contact comfortably. As an added benefit for writers, acting lessons can help you learn how to dig deeply into a character, and this can greatly enhance your writing. I can personally vouch for the effectiveness of singing lessons in helping with both the voice and its use, as well as with one’s comfort in front of a group of people. I was doubly blessed — long before I studied voice formally, I had a mother who sang and who taught me good techniques, and ways of coping with audiences, from my earliest years. I learned more from my voice teachers, and from the many wonderful choir directors I worked with over the years. Other people find joining a group such as Toastmasters helpful for learning how to speak easily to an audience. From my personal experience, the preaching classes I took when I was training to become a minister (a career path that took a sharp turn) and the occasional preaching I have done over the years have done wonders for my comfort with public speaking, but that isn’t a route many want to take. Another related skill which is helpful to develop (and this is one of my personal “hobbyhorses” here) is the proper use of microphones. I have heard many people say, “I have a loud voice, I don’t need a microphone.” What may be a loud voice in an ordinary home or small group setting still may not carry nor be intelligible in a large room or auditorium. If there is a microphone, use it. If your message is important enough to get you up in front of that group, it’s important enough to take the steps to ensure that the group hears you. If you know you’re going to be speaking somewhere where there’s a microphone, if you have the opportunity, arrive a little early so that you can practice with it. Otherwise, ensure that you are speaking directly into it, not turning your head away, nor standing too far away (nor too close). If it’s a standing mic or a table mic that you can remove from its stand, hold it in your hand. It’s much easier, and more comfortable to hold the mic at the right distance from your mouth than to lean over it or stretch up to it. If you’re sharing the mic with someone else at a table, pass it back and forth so that you can each get your message heard. If you live in or near a city, even a small one, it should be quite easy to find a voice teacher, or an acting class — the professional theatre where I live offers a “recreational” acting class for adults that sounds perfect. If you’re in a smaller center, possibly you can become involved with a community choir, or a community drama group, even just for a season. You may find you like it so much that you keep going back! You have something worth saying! Let your voice and your ideas ring out! Singing and acting lessons also form a good foundation for a mouse who aspires to a Broadway career. I hope you’ll come back to By Word of Beth on Wednesday as I tell more about the book The Great American Mousical, which has been adapted for the stage and will be produced at the Norma Terris Theatre in Chester, CT in November. I’ve thought about taking acting classes before but it never occurred to me to take singing lessons. One of the best presenters that I have ever seen had a drama degree. She was hilarious! Acting lessons have all kinds of applications to writing — with singing, it’s probably more for the vocal production part of a presentation, but they’re both valuable! Great post Beth! I’ve been considering acting lessons as I am about to embark upon school visits, and I figure it can’t hurt as a mechanism to entertain kids! Standing up in front of a crowd is something I am not comfortable with at all. I have very slowly got used to very small groups, such as work colleaques. How timely this post, as I have an awards dinner tomorrow night and lord help me if my shop wins…lol. Hope the awards dinner goes well! This is excellent advice. I am a piano teacher. My sister teaches piano and voice. We’ve both done acting, and I work with kids and drama, and would love to offer classes for adults to try their hand at acting. It builds confidence and community and is really fun. How I wish I lived close enough to take an acting class from you! This is very interesting advice. I never thought about it. And as someone who literally shakes in her shoes if she has to speak to an audience, it would probably be very helpful! (I’m okay with kids, now, after a LOT of practice, but grown-ups scare the bejeesus out of me! :)) I was lucky enough to hear Bruce Coville speak at a local SCBWI conference many years ago and I have never forgotten it – he was so wonderful and inspiring! I’m probably more comfortable with groups of adults — it’s all in one’s experience. Acting lessons might be just the ticket for you, Susanna! And yes, Bruce Coville os awesome. I did not further my singing knowledge beyond my high school madrigal days, but it did provide a lot of experience for me to learn to better perform in public even though I truly do not like being in front of people or being the center of attention. That can be very helpful when, as a writer, I’m doing a book signing one day or reading passages aloud from my book. Definitely that training will stand you in good stead, Angela. I have had the privilege of hearing Bruce Coville speak, too. It was so inspiring and engaging. Thanks for the great post, Beth. Lots of food for thought. Thanks, Penny. Bruce Coville is incredible! Beth, this post is quite timely. I have to give a speech for one of my classes that has to be videotaped and accompanied by a PowerPoint presentation. It’s due this Friday. YIKES! I thought I would present a talk on the teachable moments in children’s lit or cooking with children’s lit, or children’s…UUgh! I’ve not even done my outline. I must present it to an audience as if I’m conducting a workshop giving out this information. I’m fine doing my lit & music program in front of children, but adults who have to analyze my work! YIKES! and YIKES! I’ve not even started, I’m so nervous. I need to calm down and connect with my inner actress. Great post. I’ll be looking up Bruce Coville.